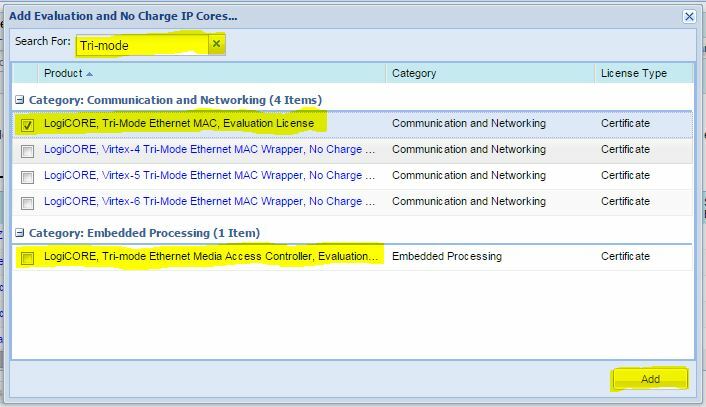 This tutorial will walk you through the installation of the 120 Day Evaluation License for the Tri-Mode Ethernet Mac. Inside of Vivado, go to Help>Obtain a License Key. Click the Start 30 Day Evaluation bullet and click Connect. 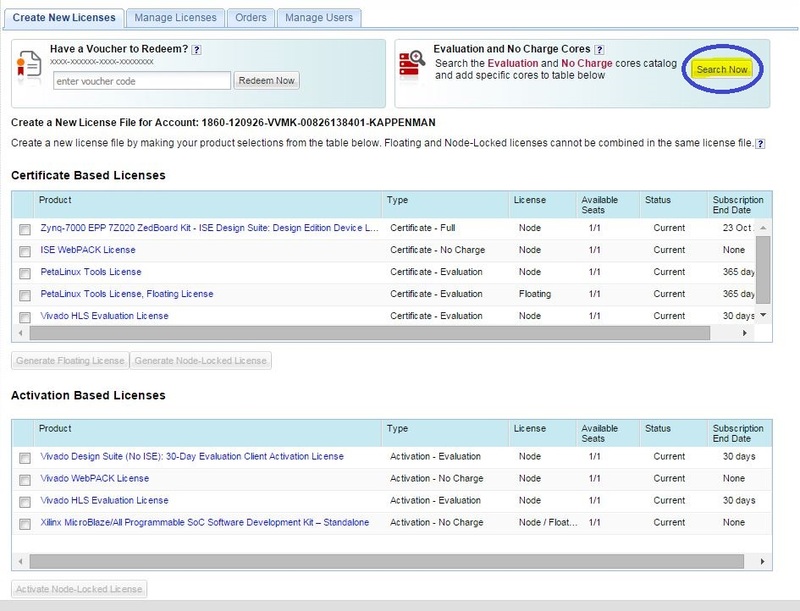 After signing into your Xilinx account, you should be on the Product Licensing screen. Click the Search button highlighted and circled below. Search for “Tri-mode” and select “LogiCORE, Tri-Mode Ethernet MAC, Evaluation License”. There is a duplicate at the bottom that you can choose, but they are exactly the same. Click Add. 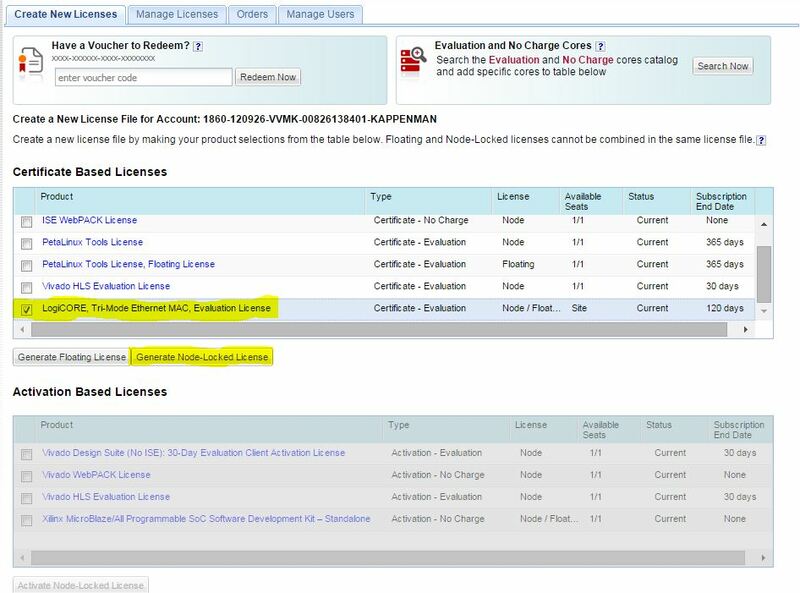 Under Certificate Based Licenses, scroll down and click the box next to the LogiCORE IP you chose and click Generate Node-Locked License. Next to Host ID, select the device that you want to install the TEMAC IP on and click Next. After reviewing your license request, click next. Accept the agreement and your License will be generated. 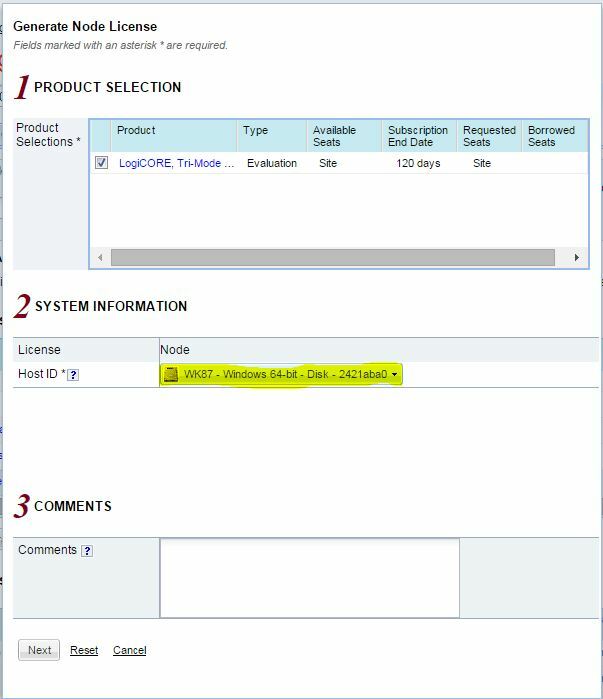 At the bottom of your screen, make sure the Product shows “LogiCORE, Tri-Mode Ethernet MAC, Evaluation License” and click the download button highlighted below. Download the .lic file to a folder you can easily find. 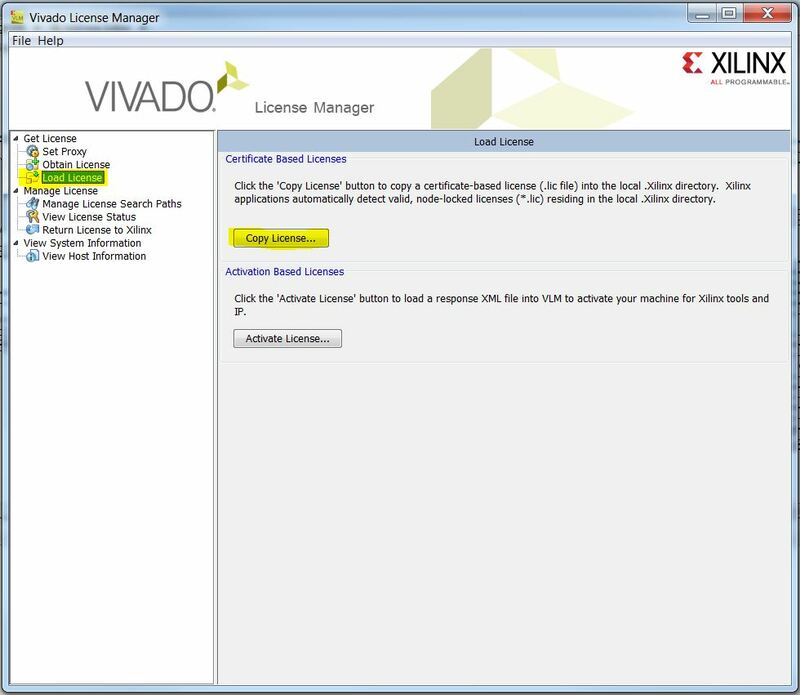 Back in the Vivado License Manager, close the Waiting for Activation window and go to the Load License tab. Click the Copy License… button and open the .lic file you just downloaded. You should get a confirmation message that your License has been installed! 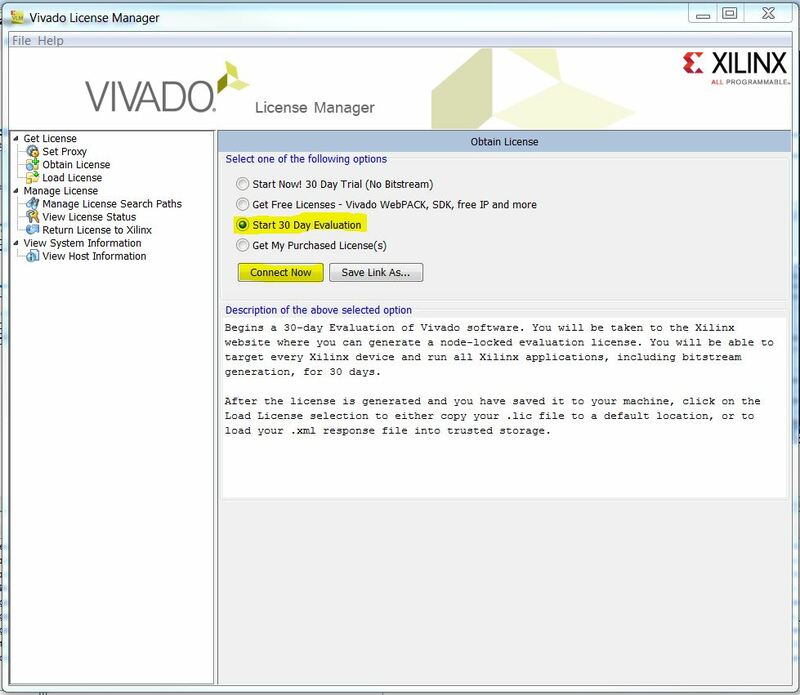 Exit the License Manager and restart Vivado and you are done!.